Manthey, LaVonne O.E. 85, of Bloomington, MN died on Feb. 12, 2018 after living 5 years with Alzheimer's. 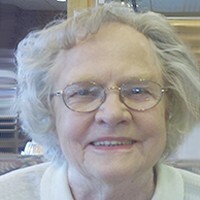 She was born in Gaylord, Minnesota, the daughter of Glen and Edna (Peterson) Johnson. She married Earl Manthey. Her home was in Bloomington, MN for 47 years. LaVonne worked at Erickson Petroleum and Lieberman. LaVonne was preceded in death by her parents; husband, Earl; son, Gerald (Jerry); and sister, Elaine Pickett. She is survived by son, Randy (Christine Anderson); grandsons, Elliot and Ethan Manthey; sisters, Lorraine Mueller, Mary Seeman and Karen Erickson; and nieces and nephews. A special thank you to the caring staffs at TowerLight and Abiitan Mill City and the Ecumen Hospice staff that provided heartfelt care during her final days. A memorial service will be held at United Church of Christ in Gaylord, MN at 12 noon on Saturday, Oct. 13, 2018. Private internment at Gaylord Cemetery. In lieu of flowers, donations to Minnesota Landscape Arboretum would be appreciated.